I'm from Zaragoza (Aragón, Spain). In Aragón there are two nationalist parties: PAR (Partido Aragonés Regionalista, www.partidoaragones.es) and CHA (Chunta Aragonesista, www.chunta.com). The Aragonese nationalist flag is like the Catalan official flag with a five-pointed red star with a black border in the center (there is a variant with a black star, I've seen it sometimes in Zaragoza and Huesca); there are some photographs of it in the CHA website. There are Aragonese flags with the CHA logo on it too. The official CHA party flag (shown on the main page) seem to be a LOB; a few of the nationalist ones (with a red star) can be seen in the party's newspaper [PDF]. On the other hand, the pictures on the website of the Partido Aragones only seem to show undefaced ones: [1, 2], or defaced with the Aragonese COA: [1, 2]; could the difference indicate red star for socialist/left wing and COA for nationalist/conservative ? I'm not sure what to make of the green-yellow-red in the last photo, also seen on the chunta website. Regional? Historical? The website of the Partido Aragones doesn't only show undefaced Aragonese flags – the second picture shows ones with the PAR logo: a small map of Aragon coloured with slant ("bend sinister") red-yellow stripes beside "PAR" above "Partido Aragonés" both in silver lettering, approximately as high as 2/9 of the flag's height (it occupies the middle yellow stripe and half of two red stripes). The logo can be seen (grey instead of silver) here. The CHA website includes a page on the history of the CHA party flag, which shows a black and white photograph of an Aragonese flag with a presumably yellow hoist triangle containing a very stylized 'CA' logo (looking like two staples). This logo in shown in other photographs of that page as red on yellow (the whole sometimes displayed on a white panel). 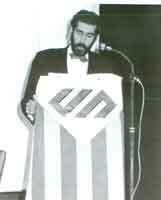 The image showing the flag is filenamed "bernal88.jpeg," so presumably it shows Chesús Bernal (CHA's Secretary General 1986-1998 and candidate in last years' elections to the Aragonese regional government) during a meeting in 1988.